2600 N. Howard Street. Photo by Christy Zuccarini. 2600 N. Howard Street, to share a beautiful space with beautiful people. We’ve taken up residence with Spike Gjerde’s Parts and Labor restaurant and Young Audiences/Arts for Learning. We moved on January 5, 2014. We’re so grateful to all the fabulous volunteers who helped us relocate from 1727 N. Charles Street to 2600 N. Howard Street. Because a permanent home gives us the security we need to best serve the community and artists. This new space provides expanded opportunities for innovative production design and quality education programs. SCT was already on the lookout for a permanent home when Seawall Development Company approached the theatre with a vision for Remington. Seawall wanted to transform a tire shop on N. Howard Street into an eating and entertainment destination for the community, and they thought SCT was just the right fit. We couldn’t agree more! 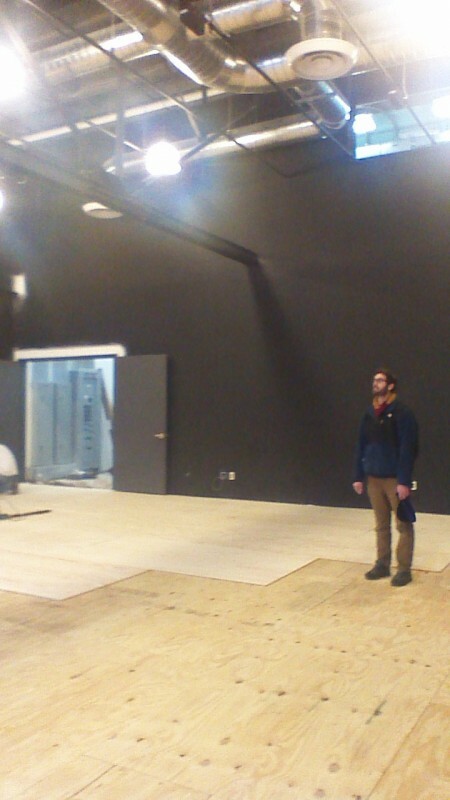 Managing Director Elliott Rauh takes in that new space smell. BUT I LIKE 1727 N. CHARLES STREET! So do we! The move to 2600 N. Howard Street was in the works beginning in 2011, a year before we moved to 1727 N. Charles Street. And though we loved the former Everyman Theatre space, it couldn’t accommodate our productions and the expansion of our education programs. Education is a keystone in the SCT mission, and we need a designated space for it. There is a free parking lot adjacent to our new home (on 26th Street, west of the theatre), and ample street parking. WHY DID YOU MOVE SO FAR FROM JOE SQUARED? See answer to question 3. And it’s 7 blocks – we could all use some exercise, especially after all that risotto. ARE TICKET PRICES GOING UP? We’re in the midst of “Not Your Mother’s Capital Campaign.” Naming gift opportunities are available here. Call 443.844.9253 anytime. If we don’t answer, we’re probably onstage, so leave a message for Batya with your name, number, and the best time for us to call you back. We have a very long wish list. Happy reading! Light on cash but long on time? We love volunteers, so shoot us an email at info@singlecarrot.com.